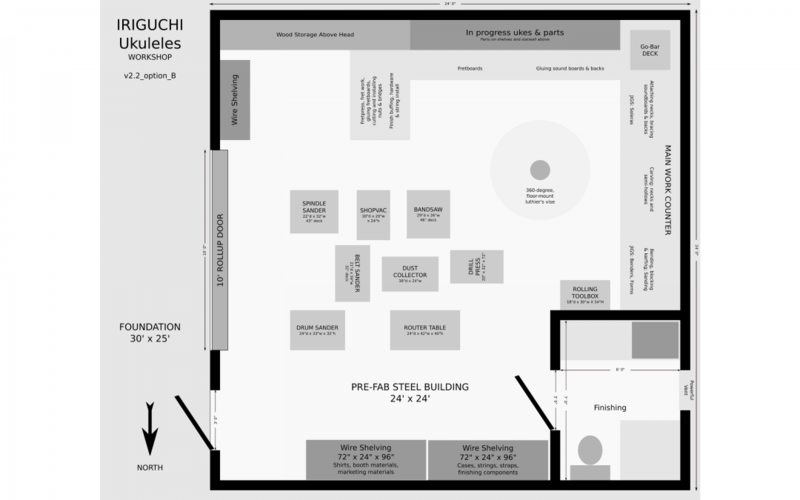 Space planning is fascinating to me. We recently re-designed our kitchen and it is now a functional masterpiece. You won’t see it’s modest design featured in Architectural Digest but whether you’re cooking for two or 22, it works, and it works beautifully. From prep to cooking to cleanup, everything is where it makes sense to be and the flow is terrific. It went through many design stages with a primary focus on function. We’re using the same approach to our workshop. As you can see by the post title we’re several versions into the design of the workshop now. 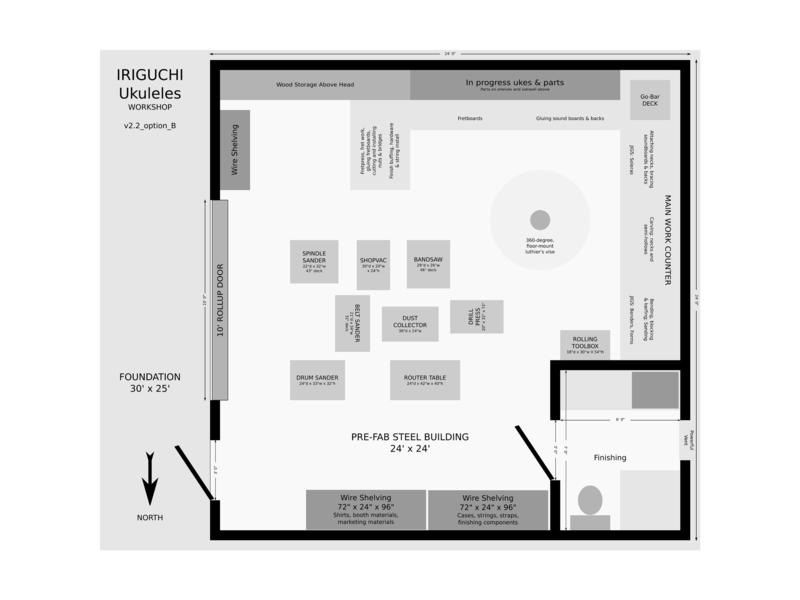 We’ve been visualizing the entire ukulele-building process step-by-step and imagining where we’ll be at each step. We’re thinking about how much room will we need at each station, where tools need to be and where supplies should be located. The environmental conditions of wood storage, how to control and clear dust, creating distinct work stations to allow scaling, planning for tooling upgrades and additions, lighting, storage, ventilation, workflow, possible solar power…it’s a fascinating exercise. I quite literally imagine doing every step of building an ukulele. I think about what tools I need immediately at hand. Should they be in plain view or in a drawer? Will the same tools be needed at another station? Should they be on a rolling cart? What issues have I run into in the past at each stage of a build? What if we had more than one person in the shop? Could they work without running into each other? Yes, it’s an interesting exercise indeed.